What soap is to your body, laughter is to your soul. Laughter may not be the best medicine, but it’s gaining status as one that’s too good to ignore. Don’t you feel good after you’ve laughed? A belly laugh increases the ability of your immune system to fight infections. Laughter is also a major weapon against stress. Recent research shows that laughter causes the tissue that forms the inner lining of blood vessels to relax or expand, increasing blood flow. Mental stress causes the opposite, making vessel linings constrict, thus reducing blood flow. Another study, found that laughter at dinner cuts blood glucose levels in diabetics. Many studies have found the stimulation of laughter increases circulation, because of its effect on blood pressure and your heart. It also increases respiratory exchange, with more oxygen coming in and more carbon dioxide going out. Cardiologists report that about 70% of the population are shallow breathers. When you laugh, you breathe better, anxiety is reduced, and relaxation results. Laughter can ease pain. You use energy focusing on pain when you’re ill. When distracted by laughter, your focus shifts away from pain, you relax and your body gets a few minutes of relief. That doesn’t mean that therapeutic laughter has become mainstream medicine. It’s accepted as music is accepted. Do you know that positive, optimistic people live longer and healthier lives? Laughter is the power of positive healing and you can fake laughter to stimulate the positive effects within your body. Cardiologists believe that one minute of laughter is worth 40 minutes of deep relaxation; and that 100 laughs a day are equal to a 10-minute jog. A real belly laugh, exercises not only your heart and lungs, but also your shoulder muscles, arms, abdomen, diaphragm and legs. And exercising the major muscle groups is only the start. Studies have shown that laughing pumps pain-relieving, stress-freeing endorphins into your bloodstream. Five minutes of giggling could give you up to two hours of pain relief. Though the process is not fully understood, the production of laughter involves various areas of your brain and by studying your brains activity in response to humor, researches are able to determine the following. 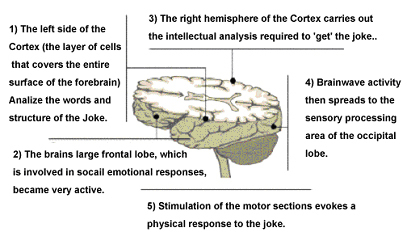 The way your brain processes Laughter is also different from how your brain processes emotional responses. Click on the links beside this to get your daily giggles, and if you have a good belly buster you would like to share, please e-mail me and I would love to post it on my site and help others enjoy the laughter.